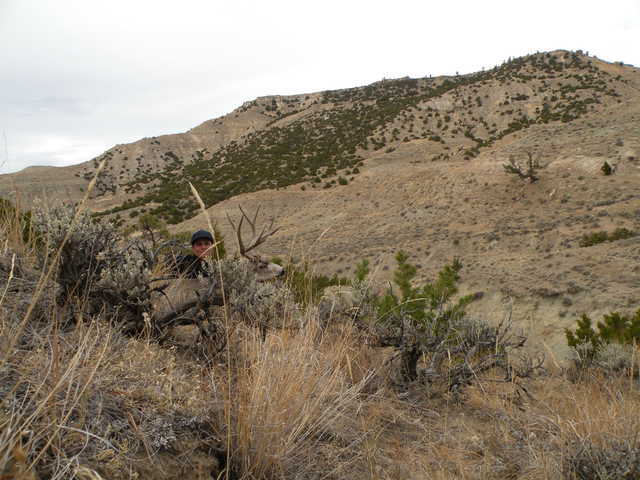 Hunting pronghorns in the best area of the US--Campbell County, Wyoming. Great hunt for young or old. This was my second hunt with Peak Adventures with Dustin Roush and Chase Briggs. 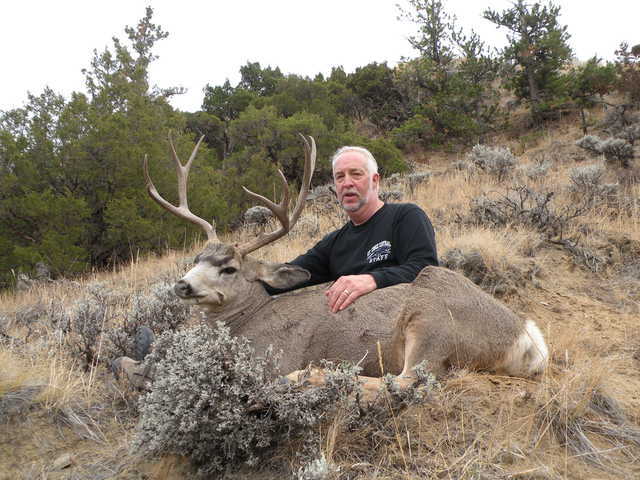 Located about 50 miles south of Gillette, WY the hunting takes place on private land. Since this was my first mule deer hunt, every buck I saw looked huge. Both Dustin and Chase had to remind me that there were bigger bucks and to be patient. ALWAYS listen to your guide! Dustin spotted this buck on the Middle Butte of the Pumpkin Buttes and after getting within 210 yards, I had this nice 4x4 for my first mule deer. Getting him out proved to be a little work. We went back to the Roush Ranch and picked up a horse and large sled. 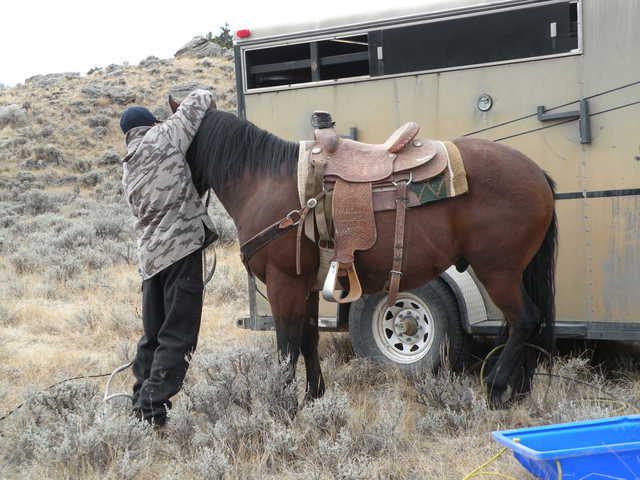 This is Dustin getting the horse ready for some work. We tied the buck into the sled, but it kept tipping over when it went over the sage brush. A rope around its head and me walking on the uphill side to keep from tipping and problem solved. But I found out that the horse could walk through the sage faster than I could! On the left side of this picture you will see Dustin peeking over the sage with the buck. I used this picture to show the good job of spotting this deer that Dustin did. 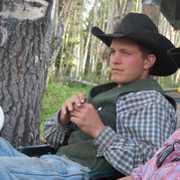 He is sitting where the deer was bedded down when he was spotted--Dustin was on the highest point you can see on the next Butte when he picked him out with his spotting scope. I also learned to trust the guide's eyes. The next morning it was time to go after an antelope. We spotted this buck bedded down with a herd of about 20. We crawled to a fence line 256 yards away but could get no closer. The 210 yard shot the day before on the mule deer was the longest shot I had ever made. I had a good rest against a fence post, and when they all started standing up, I squeezed one off with the 7mm and this 15 1/2 inch buck was on his way home to WI. 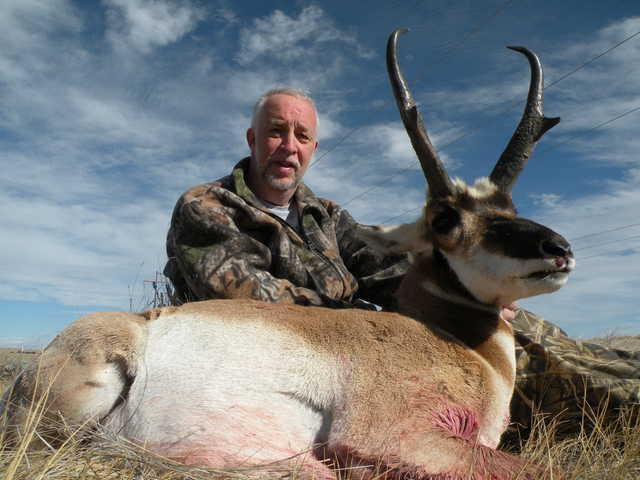 If you are looking for a great hunt that nearly anyone can do, contact Peak Adventures in Gillette, WY. With Chase and Dustin guiding you will see animals. They have a nice indoor area for butchering, a very spacious and comfortable bunk house and Dustin's wife will have dinner ready for you at the end of the day, and trust me "the lady can cook." Nice story!! 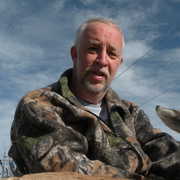 I guide hunters in Campbell county as well. It is awesome muley and antelope country! !